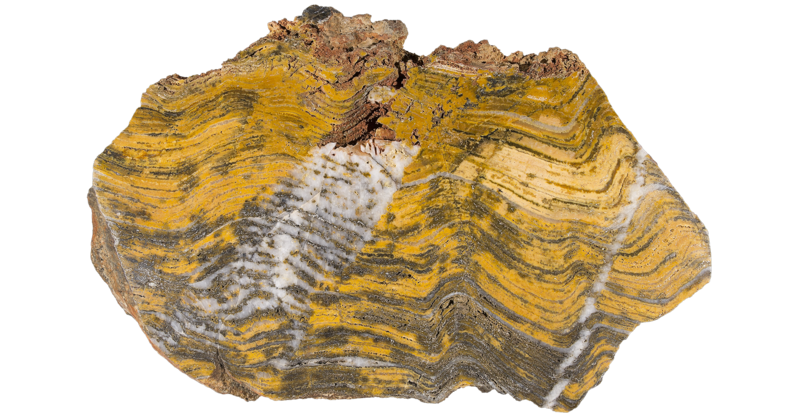 There is a kind of rocks that I really like and they are called stromatolites. The name comes from Greek words “στρῶμα-λίθος・stromatos-lithos・layer-rock”. As the name suggests, they are rocks created from many layers of calcium carbonate deposited from the oldest living photosynthetic organism cyanobacteria’s life activity and mud, accumulated and harden over a period of several million years. If we were to look at each layer of the rocks carefully, we would be able to know the environment and activities that took place on Earth in each period. Some of stromatolites exist as fossils, formed over two billion years ago, and some of them are alive, still growing in the places such as Shark Bay, Australia. Gazing at stromatolites, I think about the Earth. Albeit of the scale differences, the Earth is also a rock – alive and active -, consisting of many layers. If we were to closely analyze each layer of the Earth and trace back Earth’s timeline, we would also be able to know the environment and activities that took place on the Earth in each period. Then, I think about us, human, who have come to exist at the end of the timeline. I have heard that, our ancestor, Pithecanthropus was already walking on two legs by three million years ago. When they started walking on two legs, the separation was perhaps created between them and the ground, which used to be one with them. As they evolved and became human and civilizations progressed, the separation increasingly grew bigger. In the present, we often look at the Earth objectively, say as an admirable landscape or a usable resource. I had the chance to spend quite some time in Hokkaido last year. Especially during my stay in Shiretoko, I had the chance to observe and get in touch with the land, natural phenomena and people living there. Through this experience, I had a sensation of myself being part of the Earth, for the first time. For many of us who are living in conveniently built environments, it rarely happens that we have a realization of this apparent fact, unless we are faced with some kind of disaster. I started working on a new work in collaboration with the designer, Shojiro Okuno, taking this sensation as a starting point. Our attempt in this work is to make a landscape appear for a period of time in the underground walkway, which is a part of the built-up, urban environment in Sapporo. The landscape is Geochronostromatopio:a layered landscape created from a variety of images that are pointing to different moments of the Earth’s timeline, including minerals, topography, sceneries and traces of human activities. We sincerely hope that it will work as a device to trigger people, who are conducting their routine activity of walking through the underground walkway, to trip out into different time spans in Earth’s history and momentarily wind-up as a part of the time-capsule landscape of the Earth.